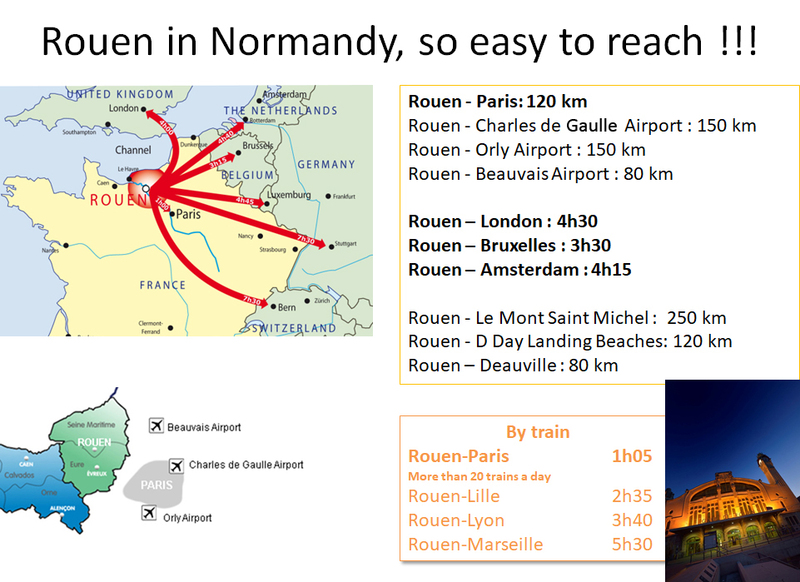 The best way to get to Rouen is to fly to any airport in Paris and then to reach Rouen by train, car or taxi. Trains go to Rouen from St Lazare Station (Paris) which is near Madeleine and the shops on Boulevard Haussmann. Trains go every hour but some are stopping trains or you may have to change. Please, check on the SNCF website for the direct fast train times. A single train second class ticket is around 25 euros. Rouen is linked with Paris by the motorway A13 (130 km) taking near two hours by car. The Rouen-England connection is done by the A28 motorway and the Channel Tunnel. For all your trips in France, we recommend to have a look on the following web site : viamichelin .